As adults, our bodies are made up of different types of cells, but inside the womb, we all began as a mass of cells which were all the same. Only during the development process did our cells acquire a definite “fate” and become specialised in their function. Some became skin cells, some bone cells, others became brain cells, and so on. This process is called ‘differentiation’. Non-differentiated cells are called stem cells. Stem cells have the power to grow into any type of cell, and hence can potentially be used to cure many diseases. For example, when an organ is injured, stem cells can be used to replace the damaged cells. Before any of this is possible, we need to understand what gives stem cells their quality of ‘stemness’ (that is, what keeps them undifferentiated), what triggers differentiation and how this conversion takes place. Deepa Subramanyam, a scientist at the National Center for Cell Science (NCCS), Pune, is working towards filling these gaps. Her research focuses on the transport of certain molecules in a stem cell from one compartment to another. This movement is critical to maintain its quality of ‘stemness’. This will help us understand what makes stem cells different from the specialised cells in our body. Since starting her lab at NCCS in 2012, Deepa has done some groundbreaking research in this field. Most experiments start with making a list of all molecules suspected to help stem cells maintain their properties. The suspects are then tested or ‘screened’ to show whether they really are involved. “Large screens are conducted to understand three important aspects of this process — first, whether different molecules get trafficked in stem cells, second, whether the route of trafficking is different in stem cells from normal cells, and third, if we perturb this trafficking, can we convert stem cells into specialised cells”, Deepa explains. Fluorescence microscopy helps Deepa observe molecules being trafficked inside cells. 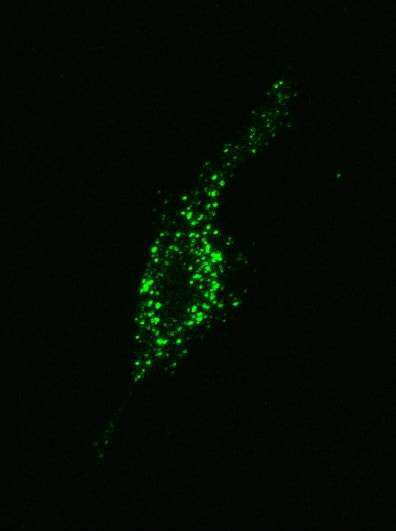 This is made possible by tagging the molecule of interest with a fluorescent protein, making it easy to track under a special microscope. Through her experiments, she successfully proved that a process called ‘clathrin-mediated endocytosis’ is essential to keep stem cells unspecialised. Now, she wants to identify the specific molecules being trafficked by this clathrin-mediated route, so that she can investigate why this route is essential for stem cells. After that, she will be able to search for a switch in the pathway that could direct stem cells to turn into specialised cells. “Genetically I am a south Indian, but I was born and brought up in Uttar Pradesh. So I do not speak very good Tamil,” Deepa says. Moving to Coimbatore to do an undergraduate degree in biochemistry was, therefore, a bit of a culture shock. “It was like throwing me into the deep sea without knowing how to swim,” she laughs, “I learnt Tamil over there and so it’s fairly hilarious.” Deepa considers herself fortunate to have supportive parents who saw her leave home at 18 without any lingering concerns about her safety. On their return to India, their main priority was to settle in the same city. “Long-distance marriages work for some people, but we never considered it. We both gave interviews and decided that the first person with an offer would fix the city and the other person would follow,” she says. This is a very common problem in India, especially in academia — so much so that it is often referred to as the ‘two-body problem’. It is a struggle for both partners to find equally attractive opportunities in one place, and what makes this worse is an unwritten policy in many Indian institutes that discourages the hiring of couples. Naturally, Deepa thinks it was lucky things worked out for them. This is part of a series of profiles of Indian women scientists whose research has been funded by Wellcome Trust/DBT India Alliance. This article was first published on Firstpost. We are thankful for a grant from India Alliance towards this series that has allowed us to invite voices of fellow science writers on this project.